The holidays are here! And with less than a month left until the holidays, there is no time to panic about what to get your favorite horse-lover! So, I have created a gift guide for anyone a little stumped on what to give every type of equestrian and for us riders to lust over. New horse owners are the easiest to shop for, especially if they haven’t owned a horse before. There is an endless list of things that a new horse needs, making it pretty simple to figure out what to get the new owner. Stall Nameplate – There is something about having your name listed under your horses name as the owner. Every stall needs a little something to let everyone know who the horse inside belongs to and a stall name plate is the solution. Most tack shops do engraving and can create the name plate in a variety of sizes and shapes with different text options, some even let you add the horse’s breed logo, like this one from SmartPak. Leather halter with a name plate – Not much looks better on a horse’s head than a beautiful leather halter with the horse’s name engraved in brass on the cheek piece. Leather halters some in a variety of price ranges, allowing this to be a gift from any giver. Again, these can be found at any tack shop, but my favorite is the SmartPak Deluxe Triple Stitch halter. Blankets – A horse can never have enough blankets, and neither can the horse owner! From stable sheets, to turnout blankets, to a fancy embroidered cooler, there is an endless option of blankets to choose from, just make sure you know the horse’s correct size so it will fit. Saddle pad or baby pad – Another thing that there is never enough of. Assuming the owner will be riding the horse, they obviously need saddle pads, so the more the merrier! Of course, a little embroidered monogram is a nice touch and makes it that much more special. I love the Rider’s International All-Purpose saddle pad or the Lettia Collection Baker baby pad, but the Ogilvy Equestrian saddle and baby pads are very popular and have amazing reviews. Horse books – There is no book that can completely tell someone how to care for a horse, so using tips and tricks from multiple different authors is a great way to broaden a new owners knowledge. The good thing is that there is a plethora of horse books that range from basic care to specific topics like nutrition or biomechanics. The “equestrian bible”, Hunter Seat Equitation by George Morris, is a necessary addition to any rider’s collection. These can be found at tack shops or at a local bookstore. Treats – Your new owner’s horse will probably be the most thankful for this gift. There are hundreds of different kinds of horse treats and a horse owner can never have too many! Ax’s favorites are Uncle Jimmy’s Squeezy Buns, Enjoy Yums Low Sugar Carrot treats, and plain ol’ peppermints. If your looking for an organic option, Charleigh’s Cookies has multiple flavors and has an option to automatically ship every month! A Horse Box – A monthly box filled with equine goodies is a gift any equestrian would want! The equestrian world is full of trendy styles that are perfect for the schooling ring and the streets. With a little research, you can find the perfect gift for the fashion-savvy rider and her decked out horse. 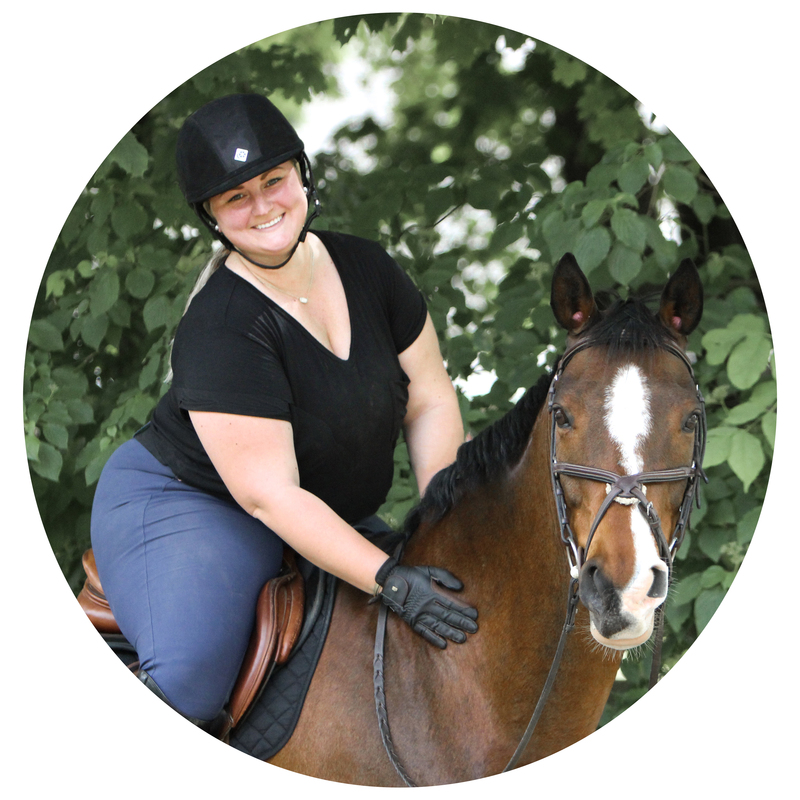 Breeches – A rider can NEVER have enough breeches and with so many brands, there are endless styles and colors to choose from in a variety of price ranges. Lo-Ride Equestrian Wear, Struck Apparel, Aztec Diamond Equestrian, and Le Fash are all highly popular brands with breeches that are on trend right now. If colors are what you are looking for, SmartPak’s Piper breeches and Annie’s Equestrienne Apparel breeches are the one’s you want, with at least eight color options each! Or you can stick with the classics that are always in style and go with Tailored Sportsman Trophy Hunter breeches or Pikeur Ciara breeches. Searching for full seats? Many of these brands offer full seat versions as well. Sun shirts – It is hard to stay cool at the barn in the warm months without exposing yourself to the suns rays. A huge trend that started this year was sun shirts. These are designed to cool the rider while protecting them from harmful UV rays. The most popular of these shirts are the EIS Cool Shirts, the Tailored Sportsman Ice Fil shirt, and the Cool Blast Riding Sport shirt. Sweaters – These are a key layering piece in an equestrian wardrobe and they don’t have to be from a tack shop. My favorite are the cable knit sweaters from Ralph Lauren Polo. Vests – Vests are perfect for keeping a rider warm without being too bulky, plus they can be worn in normal everyday clothes as well. I have The North Face Aconcagua Down Vest that I ride in and wear out, but I am lusting over the J.Crew Excursion Vest. Monograms – It is no secret that I am a monogram-aholic, and I am no the only one. While this may not be everyone’s cup of tea, monogramming is so in right now. From heat transfers for clothing and fabrics, to helmet monograms, and embossed spur straps, the Personally Preppy girls have you covered. Or you can stay classic and have embroidery added to another gift. Half pad – Of course, there had to be an option for the horse. Gone are the days of sheepskin half pads now that there are tons of options. My favorites are the Ecogold Flip Half Pad or the Ogilvy Equestrian Jumper half pad, but there are numerous others like the Thinline Trifecta half pad and the Equifit ImpacTec Contour half pad. These are for the girl who is in the show ring if she isn’t in the schooling ring. While the styles remain traditional and classic, there are always new brands that are emerging and are thoroughly drool-worthy. Show coat – Soft shell is the new wool. The new coats with technical fabrics are washable, wrinkle and water resistant, beautifully fitted, and absolutely necessary in an equestrian’s closet. Luckily, these come in tons of styles and prices. There are custom options from brands like Charles Ancona or Grand Prix, high end options that are sold off-the-rack like the RJ Classics Xtreme Soft Shell coat, and less expensive coats from Horseware Ireland and Equine Couture. Show shirt – These too have changed styles over time and the competitive rider needs to be up to date. New styles show off a quarter-button neck with a snap or magnetic collar, like the Essex Classics Talent shirt and the RJ Classics Sterling Paige shirt. Looking for a high fashion option that can be worn outside the show ring as well? The Le Fash shirts are your best choice. Helmet – There is never enough that can be done to mind one’s melon, and helmets are completely essential to a rider. There are the classic looks, like the new Charles Owen V8 with removable liners for washing and the GPA First Lady which has erupted in the hunter classes, alongside more recent styles, like the extremely well-ventilated Samshield and the rubber and leather shelled Antares. Tall boots – After a while, tall boots can definitely take a beating, so a new pair is always welcome. Like many other things, the price point of boots vary for every buyer. From off-the-shelf boots like the Ariat Heritage or Monaco boots, to custom options from Parlanti, La Mundial, or my personal favorite, Der Dau. P.S. – Still stuck on ideas? Check out these other great gift guides for more holiday shopping inspiration! They are exactly like the beauty subscriptions but for ponies! I lovw the idea of them. And I would definitely take one of everything on this list.